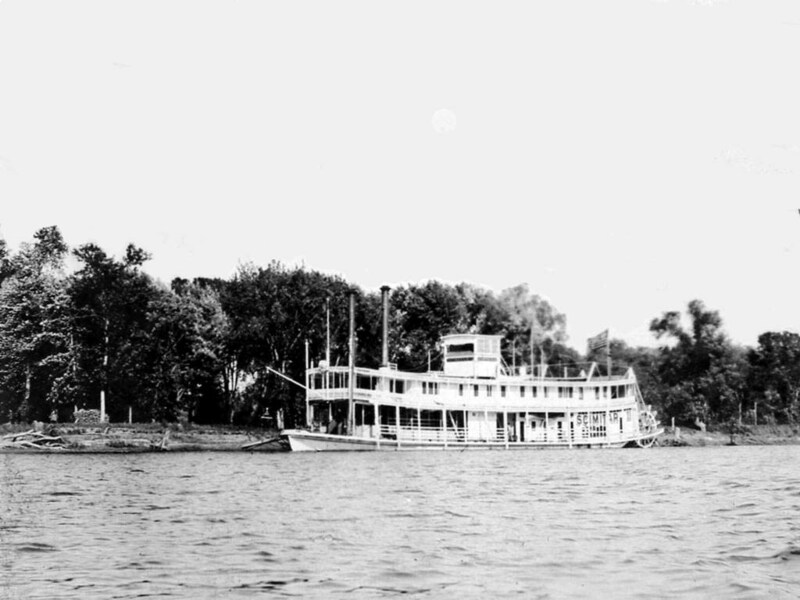 The Fred Way Packet Directory describes the Scimitar II as a private paddlewheel boat, built for prominent St. Louis banker Augustus Brewster Hart in 1905. He had the boat built for his son, who was mentally ill, in hopes that it would help his condition, but then Way adds, "Within one year the son's plight was such that he was committed to an institution." Way continues, "The boat then ran briefly Nashville-Burnside in 1906 and was sold to the U.S. Engineers who renamed her Control (see towboat directory)." The great-great-grandson of Augustus Brewster Hart contacted Steamboats.com 2/4/10 to see if we had any information about the Scimitar II and allowed us to post these photos from his collection, which are probably unavailable anywhere else. Sterling Hart added, "Family legend has it that our G,G, uncle Oliver (Augustus' oldest son) was imprisoned or institutionalized for murder of his family, or so the story goes." 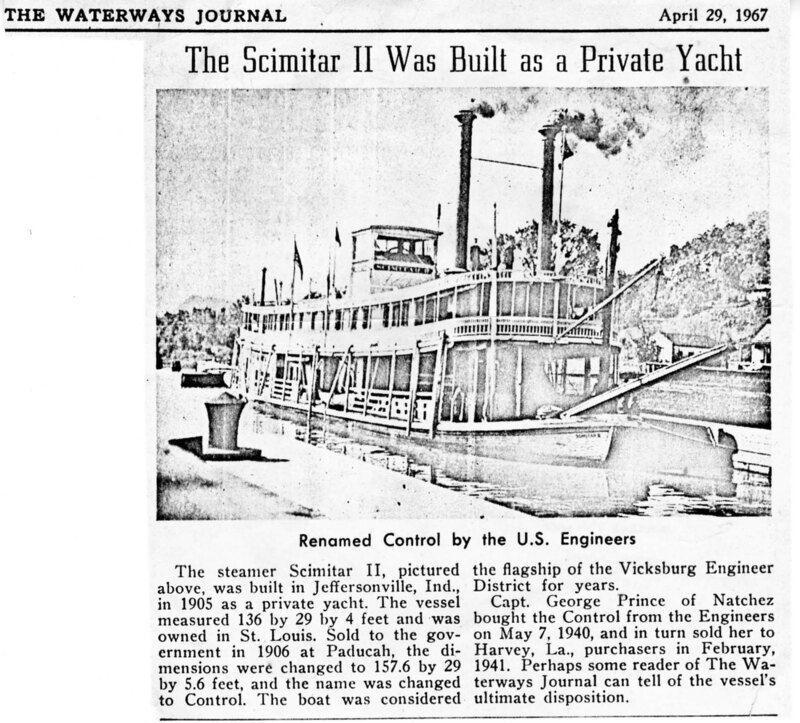 If anybody has more information about the Scimitar II, or has a copy of the Fred Way towboat directory, and can supply information about the Control, please send it in. 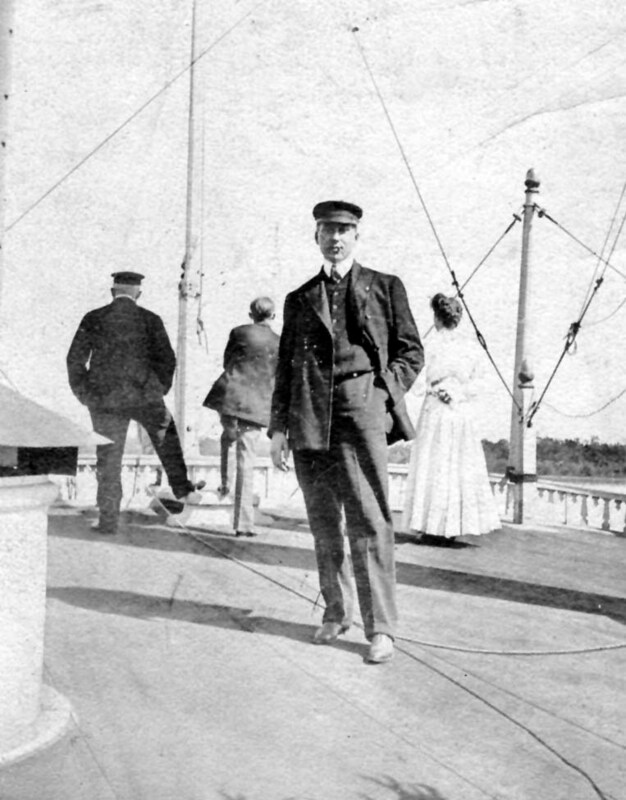 If anyone can provide genealogical information about Augustus Brewster Hart (1844-1913), please get in contact. Editor's Note: Sterling Hart comments about the first image (above), "The young fellow in the photo is possibly Oliver Hart, and the big guy with grey hair and his back turned is possibly Augustus Hart, the owner. We just don't know."